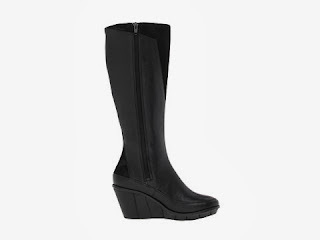 Top 25 Comfortable Women’s Dress Boots for 2014 – Podiatrist Recommended. First, it must have a thick rigid sole that you cannot bend or flex. A thin, flimsy sole that bends and flexes will cause excess motion through your foot joints, which can lead to increased chance of injury such as fractures and sprains, arthritis, bunions, hammertoes, mechanical strain and PAIN. A good shoe is a shoe that limits motion so that you have less pain, less damage, less chance of injury and, an added bonus, prettier feet. As you walk through life, you are either beating up your feet or you are beating up your shoes – if you think what your shoes look like after a couple of years of use – without the protection of a thick rigid sole – that damage is going to be happening to your joints. Second, you need arch support. Whether it is built into the shoe, over-the-counter arch support or a custom-molded orthotic – it is important to biomecahnically control your arch. When patients say to me that they have great arches and don’t need arch support, my answer is that bridges have arches but engineers still put struts under them to decrease mechanical strain. Proper arch support will help decrease knee, hip and lower back pain as well as stop or slow the progression of bunions, hammertoes and soft tissue injuries such as tendonitis and plantar fascial strain. Talk to your Podiatrist about whether or not your insurance plan pays for you to get custom-molded orthotics. They are often a covered benefit. You only have one set of feet and once they break down – you don’t get a new pair. Invest in your body and purchase good shoes and get orthotics. It’s the same rationale as a dentist telling you to brush and floss on a regular basis and a dermatologist telling you to wear sunscreen. You need to protect your body because it is just a matter of time until it tries to go south on you. Third, you need a wide and preferably soft toebox. This will decrease pressure on the toes, which will help prevent ingrown toenails, hammertoes, bunions, Morton’s Neuromas and painful corns and calluses. Forth, you need a shoe with rearfoot control. Backless shoes such as flipflops and mules are not good enough for your feet. If you are not biomechanically controlling the rearfoot with at least a strap, you are forcing your toes to curl down to stay in the shoe, which promotes deformities such as hammertoes and bunions and increases the chance of knee, hip and lower back pain. Without rearfoot control, you are forcing all of your tendons, ligaments and joints to work harder to stay in the shoe. This also causes ‘tired-leg syndrome’ and leg fatigue. If you have any severe foot issues or systemic diseases, please check with your Podiatrist to make sure that a particular boot is correct for you. I encourage patients to bring in one bag of shoes so that we can check each shoe together and have a discussion about what will or will not work for their feet. Proper shoegear is absolutely crucial! My goal as a Podiatrist is to keep my patients as active as possible for as long as possible with as few problems as possible. And this goal can be achieved with the help of proper shoegear. 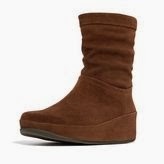 I love the Uggs! 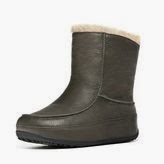 Not all Uggs are good but if you get one with a thick rigid sole, wide toebox and rearfoot control and add a dress orthotic – you are pretty much gold. The Tsubo Kynlee is a gorgeous boot. 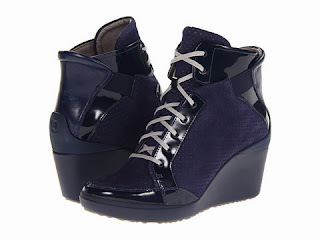 If you know that you can handle wearing a slight heel, this boot should work for you. If you have severe Hallux Limitus, Hallux Rigidus or significant forefoot isses, the wedge may not be ideal for you. Basically, if you can wear this heel height with no problems, this should be a good choice. *Severe Osteoarthritis of any of the forefoot joints. It’s hard to go wrong with Dr. Marten’s shoes. I’ve noticed that some of the Dr. Marten’s soles do bend and flex a little but most of the Dr. Marten’s have the thick, rigid sole that does not bend or flex. When shopping in the store, double check and make sure that the sole does not bend or flex. The Naot Gratify is a gorgeous boot and has a full lenfth shaft which allows for less motion through the forefoot and therefore more comfort. Not all Naot shoes have a full length shaft, which is a disappointment so if you are shopping for a Naot – make sure you get one with the full length shaft and not a partial shaft. There’s a huge difference in comfort. 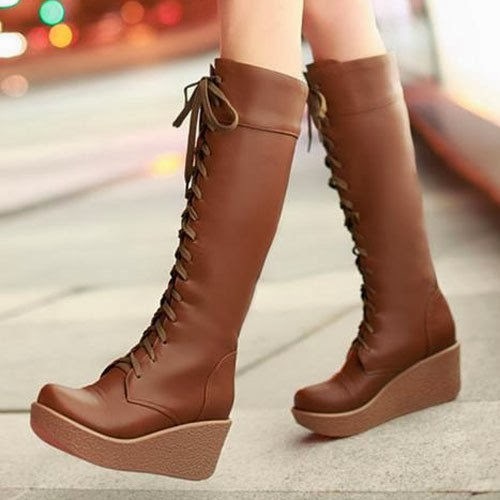 Gorgeous boot! I love the Tsubo shoes and I love to dress up jeans with this look. This heel height is not for everyone but if you know that you can wear this heel height comfortably, this boot should work for you. If you are doing a lot of walking on concrete and hard surfaces – this might be your boot. 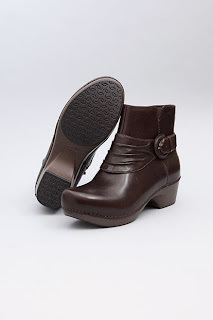 The Dansko Crepe Chukka has a thick rigid sole with NO motion, which translates into all day comfort. 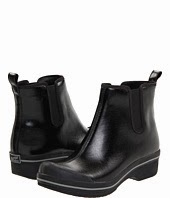 Add a dress orthotic for more arch control and it’s hard to go wrong with this boot. The only limitations with Dansko is that if you have prominent ‘bumps’ such as bunions or exostosis and bone spurs – there might be too much pressure on them which can cause pain. An option is to take the shoe to a Cobbler or Shoe Repair and have them stretch the area over the bunion or ‘bump’. Dansko is fabulous but they are not for everybody. I would recommend that if you are shopping for Dansko, go to the store to try them on. If you have large bunions or ‘bumps’ on the top of the midfoot area, Danskos might not work for you. 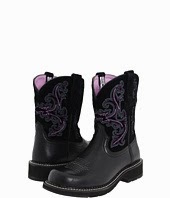 I had to add this boot because I love the style! The heel height is a bit high but if you know that you can handle this heel height, this should be a comfortable boot for you. The wedge heel gives added protection to the forefoot structures and more of a ‘roll off’ action when you walk – this will cause less stress to the forefoot. *Osteoarthritis of any of the forefoot joints. I love the Danskos but I recommend purchasing this one in the store. I’ve noticed that since Dansko has started manufacturing more shoes in China – the forefoot area can have too much bend and the toebox has gotten a little smaller and more narrow. Make sure the forefoot wedge does not bend and, if you can know that you can wear this heel height comfortably, this should be a good boot for you. This is my Christmas gift – that has still not arrived! I can’t give a full review on this boot because I don’t have it yet but it is so gorgeous and seems to meet all the criteria so I thought I’d add it to the list. I will give a further update once I get these bad boys on my feet! 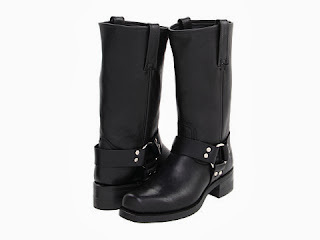 As you know, I love John Fluevog shoes and this boot is no exception. 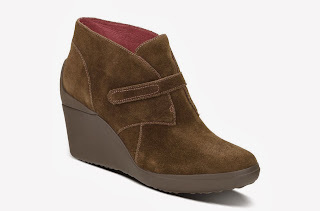 The wedge heel is solid and very comfortable. I can walk in this shoe all day. I love the wide toebox with soft leather that feels like butter. If you purchase this boot, buy extra boot laces because, for some reason, the laces on this boot break easily. 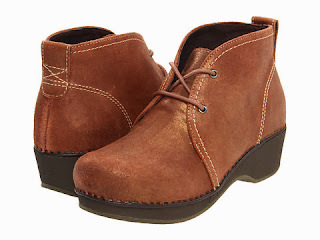 Another fabulous Dansko boot. It’s very hard to go wrong with this boot – especially if you need to do lots of outdoor walking in bad weather. I own this boot and wore it several years ago on a 10 day walking winter tour of Berlin and Vienna. With socks and my dress orthotic, they kept me warm and dry and walking in comfort all day long. The only issue I have with this boot is that the forefoot area tends to be a bit too tapered so if you have a wide forefoot, this may not work for you. 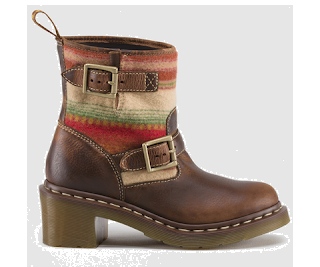 The boot has a rigid sole and great rearfoot control and it looks great under jeans. If you have a 5th toe hammertoe with a corn – either try to size up or get a boot with a wider toebox like the Alegria. *Anyone with significant ‘bumps’ or exostosis on the foot – especially the forefoot and top of the midfoot. 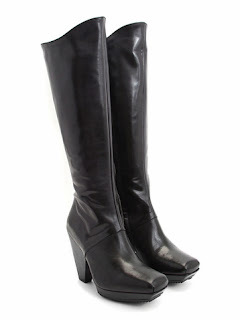 This is a great boot and I love the low heel, thick and rigid sole and the gorgous color. Add a dress orthotic for more comfort and it’s a winner. Excellent boot! 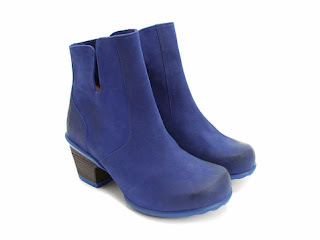 Please see my complete review of the Alegria boots (2 blog posts previous to this one, which you can find by scrolling back or typing ‘Alegria’ in the search box at the upper right hand corner). 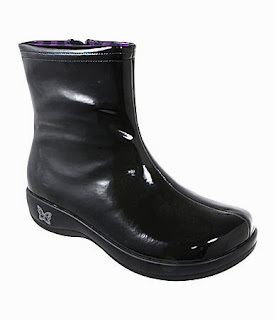 Wear a dress orthotic for maximum comfort and this is a boot that will work for almost any foot type. I don’t own this boot and have not seen it in person but I love the look and it seems to meet all the criteria. The wedge heel should stop motion in the forefoot are and, if you know that you can handle this heel height, it should be comfortable. The reviews also state that it works well for women with a wider calf. *Women who know that they can wear this heel height comfortably. This is the boot that I wore on my eleven day walking vacation of Paris and it passed with flying colors. 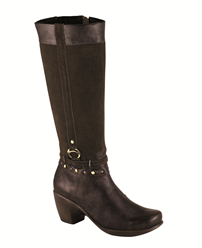 For more information and a full review of the Alegria boots, please go to the search box and type in Alegria. I did a blog post (2 previous to this blog post) where I talk about these two boots in detail. Overall, excellent boot and I paid $29 on 6pm.com. I think I got these because I love saying that I’m wearing my ‘Fatbabies’! This is an excellent boot and I wear them under black slacks or jeans and they look professional and feel great. The Fatbaby boot does have a full length shank in it but I did notice that there is still a little bit of flexion in the sole, which was a disappointment because I am a stickler for no motion in the sole of a shoe BUT, with my dress orthotic and my mild Hallux Limitus, it still works very nicely for all day wear. I love the Tsubo brand. This ankle is a bit high on the wedge but I wanted to add it because I love the Tsubo thick, rigid soles and I particularly like the soft adjustable strap across the midfoot area. This boot will not work if you have Hallux Limitus, Hallux Rigidus or any serious forefoot issues because the wedge is too steep of an incline, which will put too much pressure to the forefoot structures. If you know you can wear a heel this height comfortably, the forefoot sole has enough rigidity and cushion to give added protection to the forefoot structures. I was able to wear the Tsubo Heels at this height for many years and, as I got older, my feet were not able to tolerate it anymore. The trick is to listen to your body and if your feet hurt or if you are compensating or changing your gait in any way – don’t wear them because they are causing damage. *Women who know they can wear this heel height comfortably. 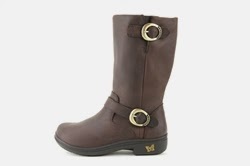 These three Fly London boots are a nice combination of style and comfort. Once again, they are not going to work for everyone but if you know that you can wear a heel this height comfortably – these boots should work for you. Yes, that is actually the official name on ebay. 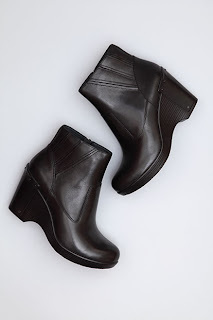 I like the thick rigid sole and, once again, if you know that you are able to wear a low wedge heel comfortably, this boot should work well for you. I also like the fact that you can loosen the laces to adjust for ankle and calf size. At the price of $39 – this is a great option for anyone on a budget. The Fit Flop boots are fabulous! They have the thick, rigid sole that does not bend or flex, a soft and wide toebox, good rearfoot control and you can add a dress orthotic to it for arch control. The only issue with this boot is that they don’t come in half sizes so I would recommend sizing up and some patients have issues with pulling them on since they do not have a zipper. Overall, an excellent boot. 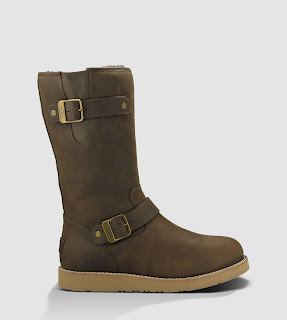 I hope this was helpful and I would love to hear any feedback that you have on these boots – or other great boots that you think should be on the list. 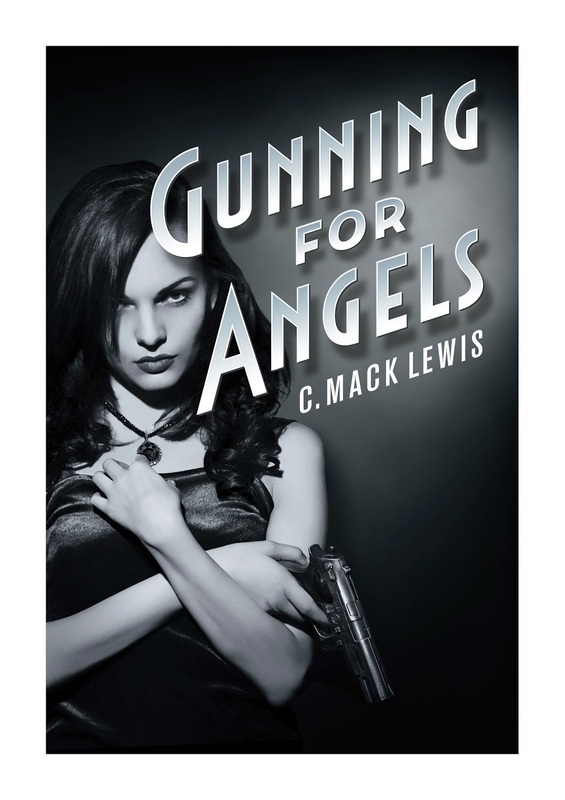 I’f you’re into detective stories – check out my book ‘Gunning For Angels’ which was written under my pen name C. Mack Lewis. It’s available on Kindle or in paperback.